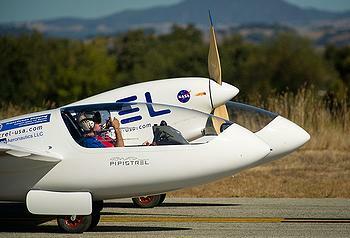 MOFFETT FIELD, California, October 4, 2011 (ENS) – The largest prize in aviation history was awarded Monday to an electric airplane made in Slovenia that won NASA’s Green Flight Challenge. The first place prize of $1.35 million was awarded to team Pipistrel-USA.com of State College, Pennsylvania for their flight in the Taurus G4, made by a privately owned Slovenian company named Pipistrel. The second place prize of $120,000 went to team eGenius, flying an electric aircraft developed at the Institute of Aircraft Design of the University of Stuttgart, Germany. The competing aircraft had to fly 200 miles in under two hours and use less than one gallon of fuel per occupant, or the equivalent in electricity. The first and second place planes, which were both electric-powered, achieved twice the required fuel efficiency, meaning that they flew 200 miles using just over a half-gallon of fuel equivalent per passenger. The competition was sponsored by Google and the prize was funded by the U.S. National Aeronautics and Space Administration, NASA. Under an agreement with NASA, the competition was managed by the Comparative Aircraft Flight Efficiency, CAFE, Foundation. CAFE has developed award-winning flight test equipment and software recognized across the aviation industry. Fourteen teams originally registered to fly their electric, biofueled or hybrid powered aircraft in an effort to take top honors as the most fuel efficient, small aircraft in the world. Three teams successfully met all requirements and competed in the skies over Santa Rosa, California from September 27 through October 1. The awards ceremony and the Green Flight Challenge Exposition hosted by NASA was held Monday at the agency’s Ames Research Center at Moffett Field. Pipistrel will donate a part of their $1.35 million prize money towards the prize for the next challenge, the goal of which will be to produce a supersonic electric aircraft. Electric aviation has developed with lightning speed. Langelaan looked back at the starting point in 2008 at the Experimental Aircraft Association convention at Oshkosh, when Larry Fishmans battery powered Electraflyer C was first flown publicly. This one person airplane cruised at 70 miles per hour and endurance was about 45 minutes, Langelaan recalled as he accepted the award. Just three years later at the Green Flight Challenge, two electrically powered aircraft flew 200 miles at well over 100 miles per hour. 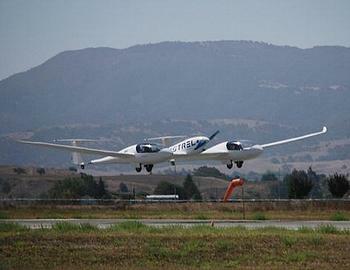 The competing aircraft recharged their batteries using geothermal electricity from The Geysers geothermal fields in the mountains north of Santa Rosa. They recharged at the CAFE Flight Test Centers first-ever electric aircraft charging station, sponsored by Google. “We are witnessing and participating in the birth of personal air travel that is both affordable and truly green,” Langelaan said. This week’s competition marks the culmination of more than two years of aircraft design, development and testing for the teams. Collectively, the teams invested more than $4 million in pursuit of the challenge prize purse. “I’m proud that Pipistrel won, they’ve been a leader in getting these things into production, and the team really deserves it, and worked hard to win this prize,” said Eric Raymond, team leader of eGenius. 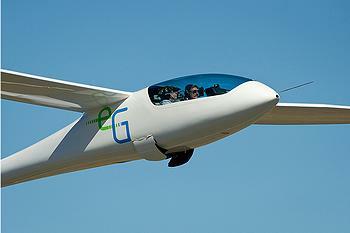 Organizers said the Green Flight Challenge represents the dawn of a new era in efficient flight and is the first time that full-scale electric aircraft have performed in competition.